Please check the ISBN that your instructor provided. If the ISBN-13 does not match this product (9781337901499) or its Printed Access Card equivalent (9781337901512) this may not be the correct product. In some cases, you may also require a course code from your Instructor. 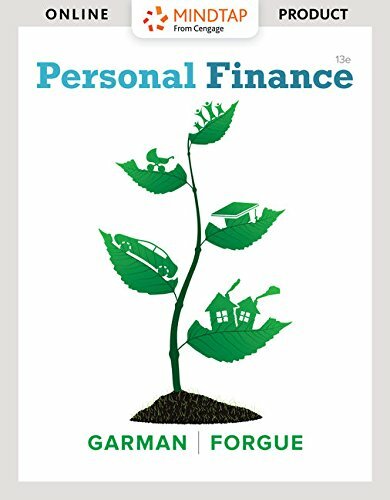 MindTapV2.0 Finance for Garman/Forgue's Personal Finance, 13th Edition, helps you learn on your terms. INSTANT ACCESS IN YOUR POCKET. Take advantage of the MindTap Mobile App to learn on your terms. Read or listen to textbooks and study with the aid of instructor notifications, flashcards, and practice quizzes. MINDTAP HELPS YOU CREATE YOUR OWN POTENTIAL. GEAR UP FOR ULTIMATE SUCCESS. Track your scores and stay motivated toward your goals. Whether you have more work to do or are ahead of the curve, you"ll know where you need to focus your efforts. And the MindTap Green Dot will charge your confidence along the way. MINDTAP HELPS YOU OWN YOUR PROGRESS. MAKE YOUR TEXTBOOK YOURS. No one knows what works for you better than you. Highlight key text, add notes, and create custom flashcards. When it"s time to study, everything you"ve flagged or noted can be gathered into a guide you can organize. Instructor Assigned: Please be aware that the product you are purchasing is usable only if assigned by your instructor. If your instructor has not assigned this product, you should not continue with your purchase. This product requires a Course Key from your Instructor to fully activate. Please consult your Professor or class syllabus for the specific Course Key. ISBN: 9781337901499 Access to this product is valid for 180 days of usage. After this period, this product can be viewed under the "view expired" link in your CengageBrain account.